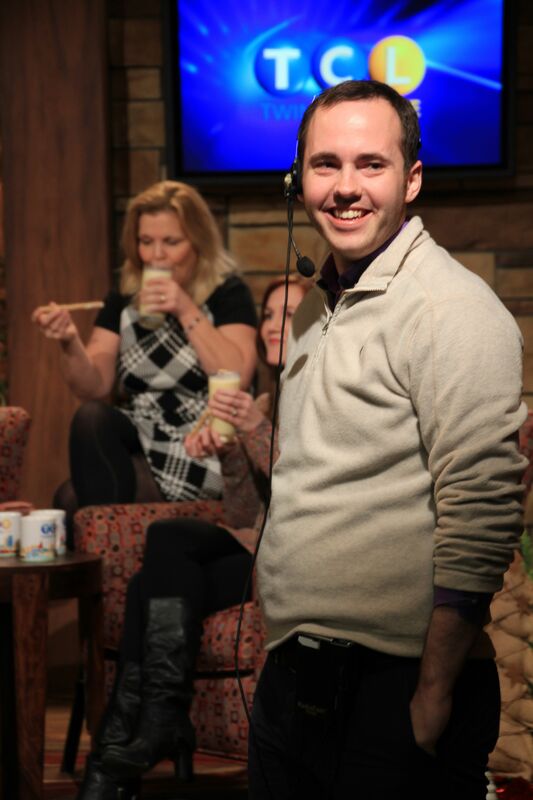 Behind the scenes of Twin Cities Live, it seemed everyone had a question for Mike Marcotte ‘08. 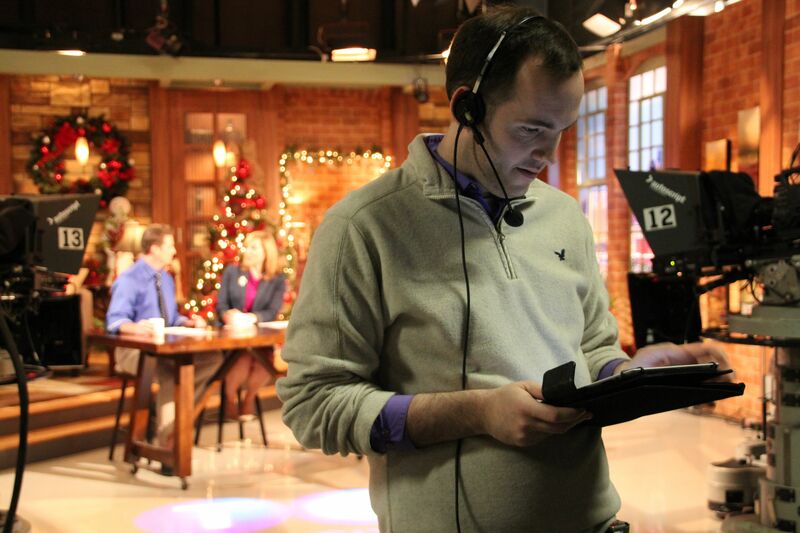 With his iPad in hand, he drifted from the eggnog cocktail demo table, to a laptop live-streaming reindeer at Como Zoo, to the giant cameras with teleprompters, where he directed traffic between segments. As the assistant producer and guest coordinator of the show, it’s his job to help ensure that everything runs smoothly. It’s a role that requires attention to detail, executive decision-making skills, and the ability to build rapport with guests and audience members. A proud Gustie, Marcotte credits much of his professional success to his four years on the hill. Even though his job is demanding, he stays connected as chair of the Gustavus Young Alumni group. Marcotte has found his niche in the local media market, but he didn’t major in communication studies. He majored in elementary education. After graduating from the elementary education department, he interviewed for positions in two school districts, but didn’t land either. The job market was tough, but Marcotte says he had plenty of experiences to fall back on. He worked as the senior marketing coordinator for Big Brothers Big Sisters of the Greater Twin Cities for two and a half years before joining the Twin Cities Live team in 2011. Thanks to his involvement in leadership activities like the Campus Activities Board, Student Senate, Campus Caucus and the Minnesota Association of Private College Students, he hadn’t wasted any time networking both on and off campus. The summer after his freshman year, he landed a job with KSTP, working at their Minnesota State Fair booth every summer. By the time he graduated, he was doing promotional events for four Hubbard Broadcasting stations: Channel 5, Channel 45, myTalk 107.1 and 1500 ESPN Twin Cities. About a year in, his colleagues invited him to host a four-minute segment that he had been producing called “What’s Happening This Weekend.” Not intimated by the camera, Marcotte accepted the offer and claimed bow ties as his signature on-air accessory. “Every Thursday, I’m on and I give my picks. It’s really kind of fun because it’s all editorial. I get to go out and I hear about a lot of cool things that are happening, a lot of people sending me info,” said Marcotte. The variety has led to some amusing situations. Asked to share one of his greatest bloopers, Marcotte recounted the time he invited a llama to his segment. Off-air, he made a dash to bring it a bowl of food and wiped out on the kitchen set the moment before the show went back live. The cameramen and hosts couldn’t resist sharing the scene with viewers. This sort of fumble doesn’t seem to faze Marcotte. He takes his responsibilities seriously, but he’s able to improvise and he appreciates a sense of humor. Asked if he has any interest in transitioning into broadcast journalism, he said he wasn’t interested in doing hard news. When he’s ready for a career change, Marcotte says he’ll consider going back for a K-12 teaching license, since his K-8 license has already expired. Ideally, he sees himself merging his love for communications, marketing and media with his passion for teaching. In the meantime, he’s stayed well connected with Gustie teachers. In fact, he coordinated an audience of more than 20 Gustie teachers for a Twin Cities Live show this past August. “They had a blast, so we’re going to try to make it an annual thing,” he said. Outside of work, Marcotte serves on the board of directors for the Minnesota Boychoir, and runs the Gustavus Young Alumni group. The latter commitment underscores Marcotte’s determination to staying connected with his Gustie roots. Marcotte co-founded the organization with the 2008 co-class agent, Adam Eckhardt, and stepped up as chair when Eckhardt went back to school for an MBA. Since their first event in June 2011, this grassroots alumni organization has expanded to include one or two class representatives from each of the last 10 graduating classes. “The Young Alumni thing is huge now, which is really exciting for us because we’re planning an event every month for 2014. We have a very ambitious schedule and we’re reaching a larger base of people,” said Marcotte. Gustavus Young Alumni events are also a great way to reconnect with old Gustie friends, meet new people with a shared experience, and find a lead for the next job. The Office of Alumni and Parent Engagement supports the group, but gives members the liberty to be creative in what they do and how they connect with people, says Marcotte. Even with his monthly dose of Gustie interactions, Marcotte still sets aside time for those he began eating with in the cafeteria his freshman year. Erin Luhmann graduated from Gustavus Adolphus College in 2008 with a major in English and a minor in peace studies. She then taught English in Kyrgyzstan as a Peace Corps Volunteer (’08-’10) and completed a master’s degree in journalism from the University of Wisconsin-Madison in 2013. As a graduate student, she won a New York Times contest to travel and report alongside columnist Nicholas Kristof in West Africa. She now works as a freelance reporter in Minnesota. Proud to call this guy my friend! Mike is the best! 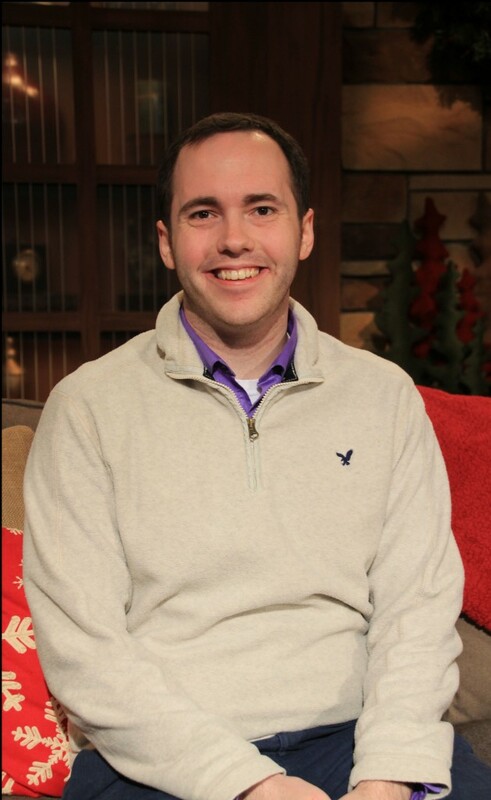 We are so lucky to have him on the Twin Cities Live team! He is talented, hard-working and just a great all-around guy. This article is a great nod to Mike and all he does to give back everyday!